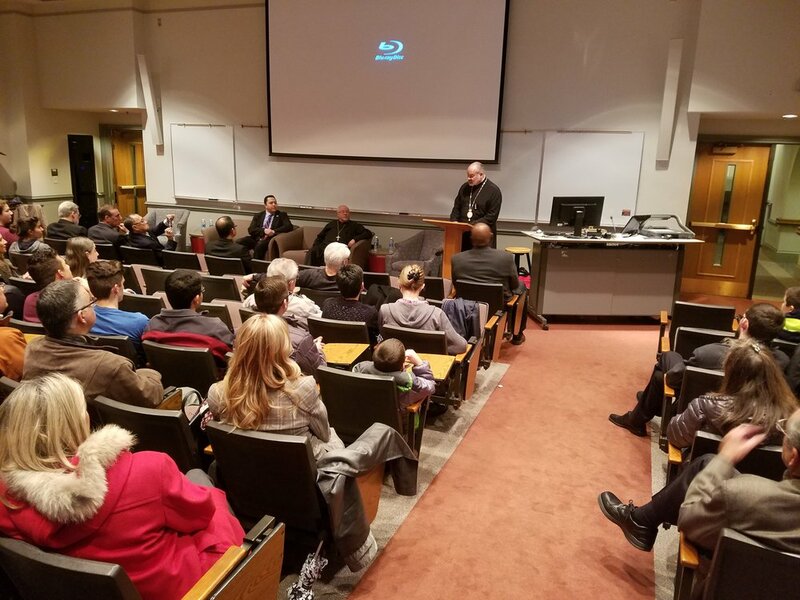 WHEATON, IL: The Greek Orthodox Metropolis of Chicago was honored to join with Wheaton College to offer a FREE Public Screening of the new documentary "Modern Christian Martyrs" on Wednesday, March 29, 2017, at historic Blanchard Hall on the campus of Wheaton College. A Question/Answer Session followed featuring Greek Orthodox Bishop Demetrios of Mokissos, Antiochian Orthodox Father Nicholas Dahdal and Robert Sweise of the Chicago Chapter of In Defense of Christians, all of whom are in the documentary. This FREE event was hosted by Wheaton College's Department of Politics and International Relations, the Center for Urban Engagement and the World Christian Fellowship together with the Greek Orthodox Metropolis of Chicago. The documentary “Modern Christian Martyrs” concerns the ongoing Genocide of the Christian minority population of the Syria, focusing on the Alkhoury family of Chicago and featuring Bishop Demetrios of Mokissos, Bishop Munib Younan, US Congresswoman Anna Eshoo, Father Nicholas Dahdal, Reverend Stan Davis and Rabbi Michael Balinsky, just to name a few. The documentary was produced by the Greater Chicago Broadcast Ministeries and the Greek Orthodox Metropolis of Chicago and has been aired on The Live Well Channel 7.2 each Sunday throughout March. The documentary is available on the website of the Greek Orthodox Metropolis of Chicago; www.Chicago.GoArch.org.